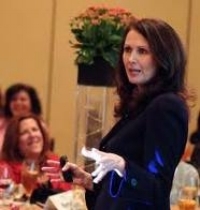 I had the good fortune to present to two very dynamic groups of women leaders recently. First, Medtronic's women in technical field sales who provide medical devices like pacemakers and diabetes supplies to hospitals around the world. Next, the Arizona Women's Leadership Forum, a 17-year-old organization with a Who's Who of Fortune 500 members from American Express, Boeing, EY, Honeywell, and many more. You know which of my discussion points got the most attention? That we not only need to lean in, but we also need to lean on the men in our organizations. The sad truth is that 28% of men don't see any gender bias in the workplace, while 49% of women see all too clearly that many of us get stuck in mid-level support or administrative roles that offer few advancement opportunities. Of course, it's up to us to ramp up our confidence, take some risks, and get our voices heard But I want to give you some additional strategies to get men on board - without seeming overly defensive or aggressive. And I strongly suggest you forward these tactics to those enlightened males who can help the cause. Focus on specific skills and criteria. When it comes to recruiting and promotions, take as much subjectivity out of the process as possible. The data confirms that while men are often hired for potential, women are typically hired for proven track record. Help us level the playing field. Use the data to our advantage. If your company has a diversity and inclusion initiative, know what it says and how you can use the numbers to help deserving female colleagues. In virtually every country that's approaching gender parity in politics or the workplace, some kind of affirmative mechanism has been put in place. Be aware of “micro-aggression” messages. Help up stamp out the "bro culture" by having the courage to point out the subtle slights and unintentional biases to which women are often subjected. Sure, those little jabs aren't going to kill us, but they breed a kind of cultural norm that's better left in the past. Discuss bias openly. Most women don't want to be the flag wavers for gender equality, but given the opportunity, most of us will willingly share our thoughts with male colleagues. We want you to see things from our point of view. Gender parity means everyone wins. There are plenty of studies that show that having more women in the C-Suite and on corporate boards makes a significant positive impact on the bottom line. In fact, a recent McKinsey study points out that gender equality could add $12 trillion to the global economy. Isn't that worth working toward? Newer PostLeaders Need to Lighten Up - On Themselves!